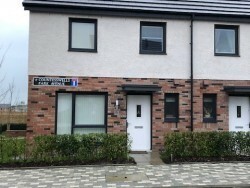 Castlehill Solutions (part of Castlehill Housing Association) currently has a 2 bedroom house available for rent. Open plan kitchen, living room. Downstairs WC. Family bathroom upstairs. All white goods and flooring included. If you would like to know more please call Castlehill Housing Association on 01224 625822.